At Verve, our mission is to make movement accessible and inspiring for everyone. We proudly offer a diverse range of classes to best help you reach your fitness and mobility goals. Please contact us if you would like assistance finding the best class for you. Essentrics® is a unique non-impact, full-body workout that works your muscles at full extension. The technique rapidly improves your posture and changes the shape of your body developing lean, strong and flexible muscles. You’ll leave feel healthier, younger and more energized. Improve your flexibility, dexterity and concentration with this dynamic barre class. Integrating different movement techniques including dance, strength training and cardio, you’ll feel both inspired and challenged. 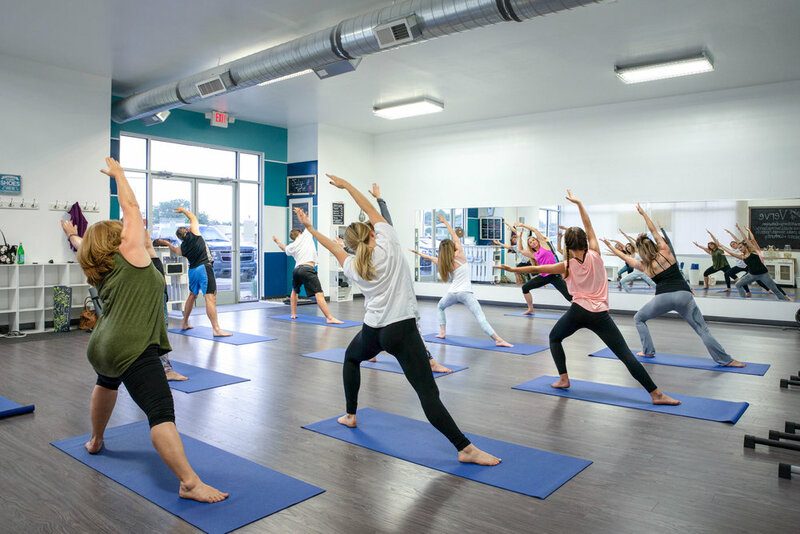 Vinyasa Flow Yoga is a challenging, all-levels class that blends flowing yoga sequences with opportunities of depth and reflection for a truly dynamic practice. This slow flow class provides poses that range from gentle to challenging, all done with stable, self-centering energy. The pace is slower, and emphasis is placed on safe alignment and maintaining slow breathing. This makes it particularly well-suited to newer students, or for those who desire deep concentration within their practice. Morning Flow 45 is a slow-flowing, integrative hatha yoga practice to energize the body and invigorate the mind. This class stimulates the physical and energetic body while bringing awareness to the whole self. The perfect way to start the day. Based on the bestselling book and PBS special, Aging Backwards. Regain your mobility while slowly building strength and reawakening the power of your 650 muscles. Ideal for all levels, this class has a slower pace than our general Essentrics® classes. This class is great for those who have atrophy-related stiffness, chronic aches and pains, or are new to the Essentrics® method. This gentle class begins on the floor, and may include a few standing positions, or slow flowing sequences. Through the pairing of stillness, deep lengthening, and micro-movements, explore your unique alignment and intuition. Honing awareness cultivate breath, balance and suppleness, coming to a greater understanding of your own well-being. Movement meditation is a discovery into a meditative state, while incorporating simple movements. It is a way to calm the mind, create awareness and go inward with contemplation, kindness, non-judgment and compassion. It allows us to discover the parts of ourselves that need attention or healing while allowing the gentle movements to give us subtle reminders of our overall health and well being. This integrative Pilates Mat class is great for all levels of experience. Learn to pair breath with movement, activate and define the core muscles, and challenge yourself with full-body movement. *All Pilates mat classes are included in Verve 10-Class Passes and Monthly Memberships. This floor-based class targets the connective tissue of the hips, pelvis and lower spine, to complement the dynamic and muscular styles of yoga and movement. Created as a preventative and healing practice, restorative is also perfect for those experiencing anxiety, depression, insomnia, fatigue and digestive issues.